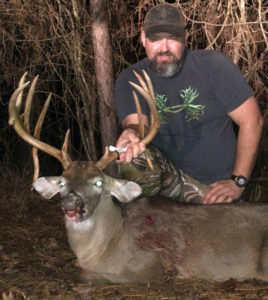 Shannon Harper of West Monroe downed this impressive 14-point Lincoln Parish buck on Jan. 19. This Monday, Jan. 21, a rare phenomenon took place: The world witnessed a Super Blood Wolf Moon. Since ancient times, the first full moon of the year has been named for howling wolves, and this year’s event also featured a full lunar eclipse. Shannon Harper probably wasn’t t thinking about wolves when he marked his calendar to be on his deer stand two days prior to this month’s full moon. Instead, he was thinking about big bucks, one impressive Lincoln Parish beast in particular. “Trail cam photos had been showing this buck coming out right after dark, but I knew that as the full moon approached, his visit to my food plot would be earlier each evening. This is why my calendar had the few days prior to Monday circled — I felt my best chance at him would be just before the full moon,” said Harper, 46, a business owner from West Monroe. 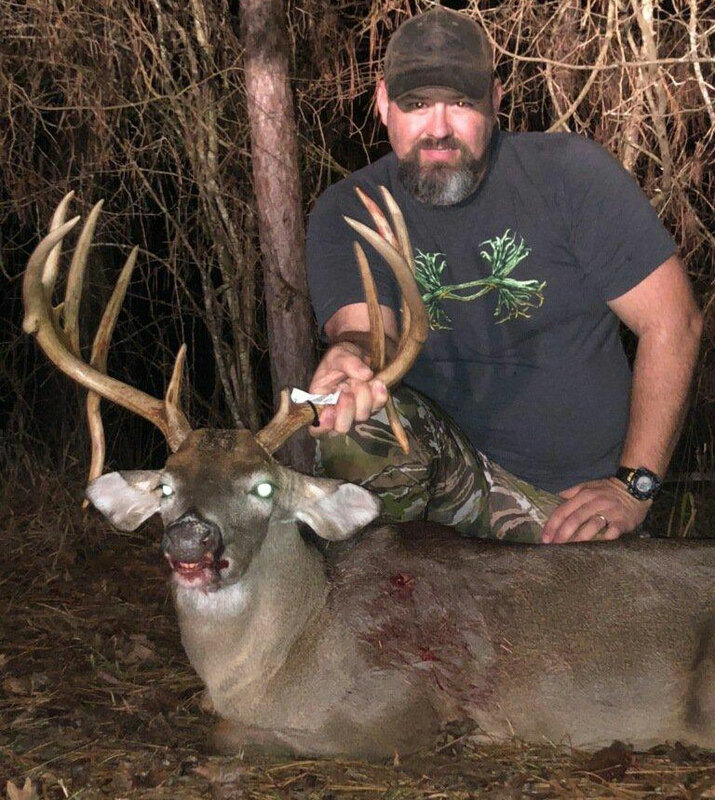 He hunts on a friend’s land in eastern Lincoln Parish, property that features a patch of woods and a clear cut. “I really liked the way this property was set up that allowed me to get to and from my box stand without disturbing the deer,” he explained. The object of Harper’s interest was a particular buck that had exploded from a big 9-point last year to a mainframe 10, with two drop tines this year. 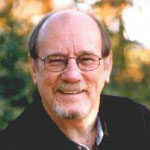 “I had been getting trail cam photos last year of two big bucks, a 150-class 10-point and the 9-point. I got no photos of either deer this year until the middle of November, when what had been the 9-point began appearing on camera. After studying photos of the particular deer over the past two seasons, I determined that last year’s 9-point and this year’s drop tine buck were the same; a distinctive bump on the right antler last year also appeared on this year’s buck,” he said. Harper utilizes trail cameras that send photos to his cell phone when triggered, and he began monitoring the timing of the big deer’s movements, noticing that the closer to the full moon the earlier the buck was showing up. “He has been in the company of three smaller bucks that usually show up at the feeder on the food plot first followed by the big one. With an approaching rain event and cold front with a full moon Monday, I had a hunch that Friday might be the day he showed up before dark,” Harper said. Shannon Harper’s double drop-tine, Lincoln Parish 14-point green-scored just north of 161 inches at Simmons’ Sporting Goods. Climbing into his box stand Friday afternoon, he settled in and about 5:30, and the trio of small bucks made their way from the clear cut onto the food plot. At 5:43, Harper looked across the clear cut and the buck he had been after stepped out. Quickly ejecting the shell and reloading the rifle, Harper kept the scope on the buck until there was no more movement, remembering that a friend had told him about dropping a buck, going to get his truck and returning to find a missing deer. 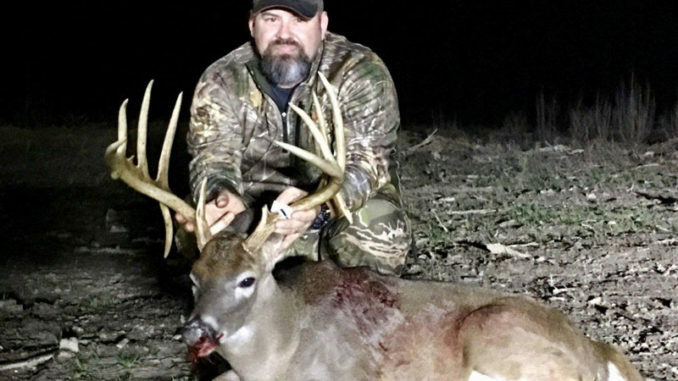 “I was down to the last three afternoons I could hunt with primitive firearms season ending Sunday, and I felt really fortunate to have a chance at the buck before it ended,” he said. The deer was a mainframe 10-point with two drop tines and two small kickers. The inside spread was 18 inches, and the buck was estimated to be 4 ½ years old. Rutted down, it only weighed 160 pounds. Harper entered his buck in the Simmons, Sporting Goods Big Buck Contest, where it was scored as a 14-point measuring 161 ⅛ inches.